Waterfront property owners, both seasonal and permanent, are a significant force in Ontario. The annual property taxes alone on the estimated $75 billion of privately-owned residential cottage real estate is over $700 million, directly supporting local governance, programs, and infrastructure in more than 200 rural Ontario municipalities. “Cottage”-related household expenditures amount to billions of dollars every year. Despite this significant footprint, there has never been a comprehensive review of this sector, nor any strategic planning related to the how this sector of our rural population could be more thoughtfully embedded into economic development. 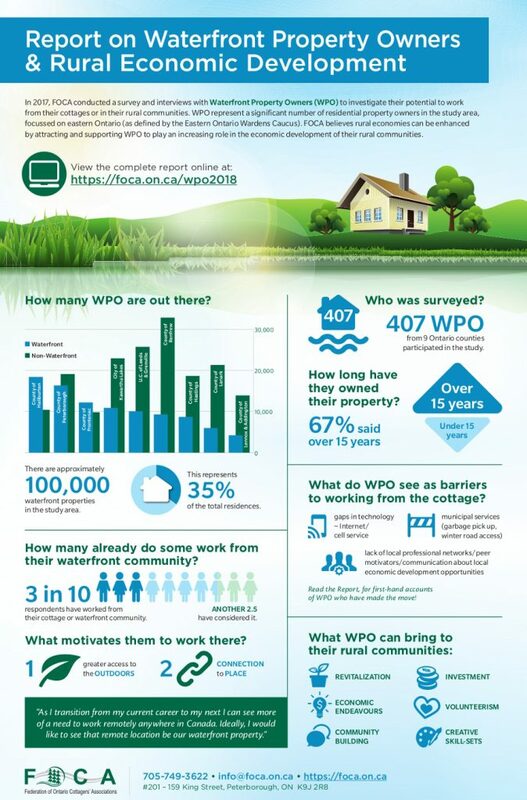 WPO represent a significant number of total residents in many rural Ontario municipalities, which are otherwise facing increasing out-migration to urban centres. 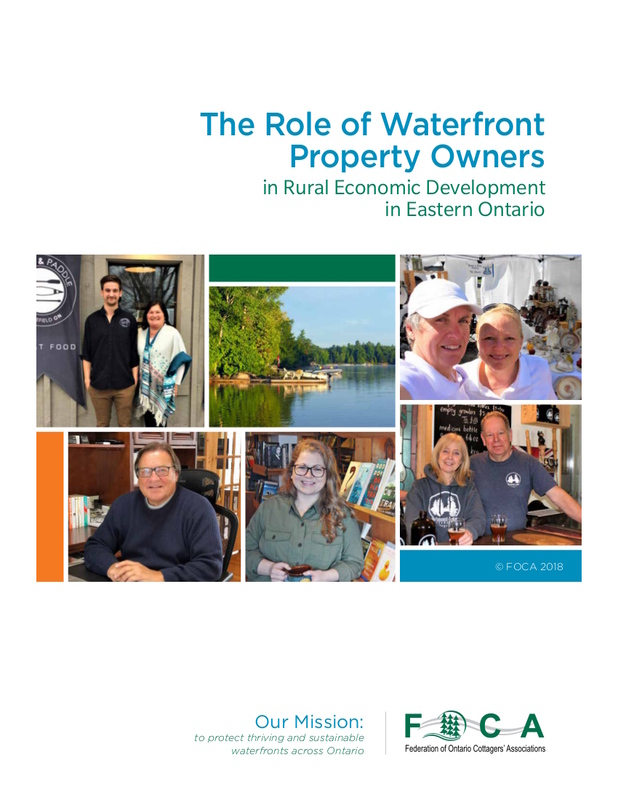 This study features eastern Ontario in particular, where tourism and a thriving cottage industry play key economic roles and where seasonal residents are spending more time at their second homes, with some choosing to relocate there, permanently. 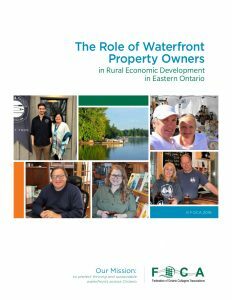 Within the eastern Ontario study region, consisting of 9 upper-tier municipalities, it was estimated that in 2012 there were 95,587 waterfront property owners, representing 35.4% of total residential properties. Based on this significant presence, municipalities of this region were the primary focus of this study. WPO can take a more active role in establishing or participating in local economic development committees in their local municipality. FOCA has a role in bridging the gap and build stronger engagement between WPO and municipal interests, to better connect WPO with local economic development personnel, programs, and chambers of commerce. FOCA has a role in fostering local networking opportunities to connect WPO with peer mentors who have successfully made the shift to rural work/life, as well as rural economic development organizations that can support and connect WPO with local opportunities. Continue to invest in rural high-speed internet service and other year-round services (social services, infrastructure), to increase the appeal for WPO to relocate (or start) their businesses in rural communities. interests of WPO in community economic development (CED). For a digital copy of the complete 56-page report, please contact communications@foca.on.ca. November 2018 – OPPI Ontario Planning Journal – Vol.33, No.6 is all about “Rural Ontario” – see the article about FOCA’s WPO Report on pages 5-6 (PDF, 6 pages) of the November-December edition. August 30, 2018 – Yahoo News – “Endless summer? – Canadian getaway towns embrace year-round living.” This story was also featured in the Christian Science Monitor on August 30, 2018. 40% of small business owners are planning to exit their business in the next five years. In rural areas, close to half of businesses do not have a formal business plan or succession plan. Business closures, and the consequent employment loss and empty buildings on main streets, could reduce the economy and vitality of rural communities. Entrepreneurial in-migration brings potential benefits to rural business transition, whether they are buying a business from a retiring owner or developing a brand-new business.